Näyttää kaikki 35 esinettä, jotka vastaavat hakuasi. 5. 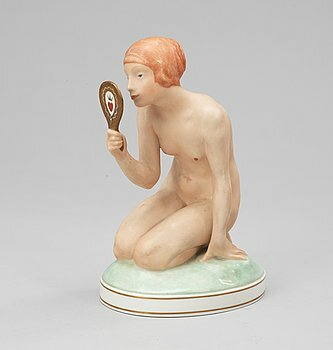 A Goldscheider creamware figure by Josef Lorenzl, Vienna circa 1936. 9. A Stig Lindberg parian figure, Gustavsberg. 18. A set of 18 French Empire dessert dishes. 39. 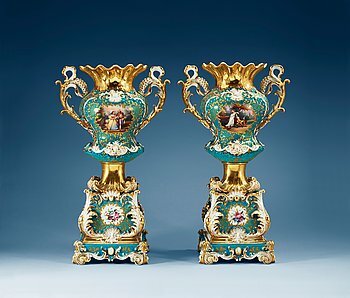 A pair of large french vases on stands, Jacob Petit, mid 19th Century. 57. 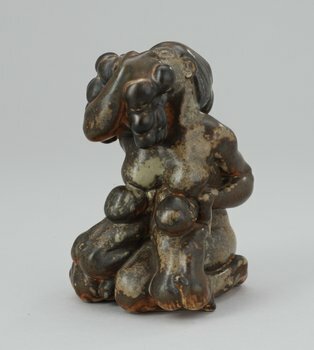 A Kai Nielsen porcelaine figure by Bing & Gröndahl, Denmark, signed. 59. 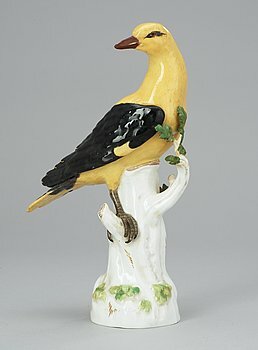 A 19th Century Meissen figure. 73. 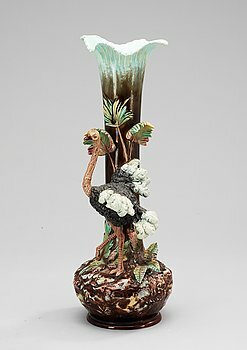 A late 19th Century majolica vase. 138. A Royal Copenhagen 20th century porcelain figure by Gerhard Henning. 142. 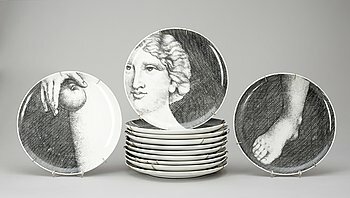 A set of twelve Fornasetti 'Eva' porcelain plates, Milano, Italy. 201. A Swedish 1920s earthenware pot, signed VN. 202. A Swedidh earthenware 1920s vase, signed VN. 207. A set of four Royal Copenhagen 'Flora Danica' dishes, Denmark, 20th Century. 255. A large vase, 19th Century. 314. A presumably Meissen figurine. 321. A 19th century Rörstrand and coffee service (24 pieces). 327. A late 19th Century creamware vase. 343. An early 20th century porcelaine plaque, probably Germany. 356. A pair of dessert plates, ca 1900. 357. A pair of "Sévres" dishes, presumably 19th Century. 358. A set of two Berlin 'Chinouserie' figures of musicians, end of 18th Century. 359. A Meissen cup with saucer and cover, 18th century. 360. A Meissen cup and saucer and cover, Marcolinis period (1774-1814). 361. A Vienna trembleuse 18th century. 362. A "Sévres" cup and saucer, 19th Century. 444. Two ceramic vases, signed A.M. Vallauris, Gerbino. 482. A Tyra Lundgren stoneware figure of a bird. 483. A Wilhelm Kåge 'Farsta' stoneware footed bowl, Gustavsberg studio. 491. 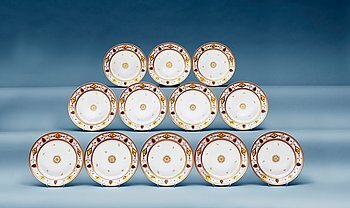 Twelve Danish custard cups with covers and plates, Royal Copenhagen 1920s. 542. A set of ten plates ca 1900 imitating mark of Sevres. 543. A Wilhelm Kåge 'Argenta' stoneware dish, Gustavsberg. 575. A set of 24 custard cups with covers and dishes. Royal Copenhagen. 579. An Axel Salto stoneware bowl, The Royal Porcelaine Fabric, Denmark. 581. Twelve Danish Royal Copenhagen porcelain fish plates and a serving dish. 585. 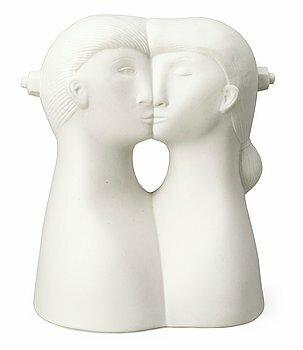 A Wilhelm Kåge 'Argenta' stoneware vase, Gustavsberg 1940. 599. An Italian faience charge 19th Century.